These plates are issued to commercial trucks and vehicles used for business purposes. In 1958, new blue on white plates were issued in the now standard 6×12 size. Old numbers were carried over to these new plates, and the plates were validated with tabs for 1958 and 1959. New registrations continued on in an A1234 format. 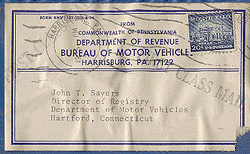 In 1960, new plates were issued in the reverse color scheme- white on blue. These plates were validated with tabs at first, and with decals beginning in 1963. They were used through 1966 and continued the A 1234 format (a space was added between the letter and numbers). These blue plates seem to have made it through the P series. For 1967, new red on white plates were issued. These plates had tab slots, but only decals were used on these plates. The tab slots were discontinued somewhere between the W and Y series. Once Z 9999 was reached, a new format was started at A10000. When the narrower dies were introduced in 1977, a space was added between the letter and numbers. During the E series, this space was filled with a dot separator. 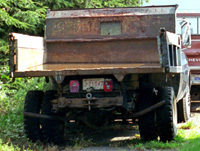 In 1987, the “map” plates were introduced. For some reason, rather than starting at H-10000, the H-1000 series was used. All series after this only used 5 numbers after the letter. With the general reissue in 2000, the “Commercial” legend became a stacked “COMM” on the left side of the plate. These plates started in the K-series. The L- series was reached in June, 2013. In late August, 2015 Commercial plates went to the new one-size-fits-all “omni-format” for Connecticut plate numbering. These are in the AB-12345 format, with a stacked “C/O/-/M/M” between the letters and numbers. (unused, the tab was never attached). A dot separator was used on plates with 5 digits. These made it up to the F series on this white base. 5-digit plates didn’t make it to this base. This is a curious plate. It certainly appears to be made in Connecticut, and there is a mailing label on the back from the Pennsylvania BMV to the Connecticut DMV. It appears as though there was another label underneath this one. Since this was about the time Pennsylvania started their “Commercial” type, did Connecticut make a few mock-ups for Pennsylvania? Or vice-versa? Mailing label on the back of the plate to the left. 1966. While we are on a slight diversion, here are a couple of low number plates. This style seems to have made it through the P series. Nothing particularly special about these last three plates except that they have managed to stay together for just about 50 years. This plate has no tab slots, and a blue reverse side. Somewhere between the ‘W’ and ‘Y’ series tab slots no longer appeared on the plates. Pretty beat-up plate, but I guess I got sick of seeing it perpetually listed for sale. The dies were changed around plate number B 60000. After the B- series finished up, the numbering jumped to the E- series. ‘C’ is for Combination plates, and ‘D’ is for Used Dealer. A dot separator was added somewhere between E 51904 and E-54471. The map base started in 1987. I don’t know why they went back to 4 numbers for this series. Purportedly a 1994 expiration. Although this plate likely could’ve been used in 1994, the decal does not belong to this plate. Commercial plates only carry April expirations. A little investigation reveals that this decal was lifted from a passenger vanity plate I happened to receive in the same batch of plates from a California (now Florida) collector. This was done for no other reason than to mis-represent the plate as a ‘stickered’ issue, and this practice should be condemned. Commercial plates received a “Replacement Sticker” like other types while awaiting new plates to be made on the reflective base. 2003. Missing a digit in the number? No, just a remake of a very old number. 2004. Remake of a more recent number. ca. late 2000s. Date stickers are no longer used on Connecticut plates. This plate was made with Avery sheeting. Notice the difference in color and gradient, and the typical issues with the paint not adhering to the embossed areas. The 7-digit format was introduced on Commercial plates in August, 2015.